"Phishing" has become all to common in SA over the last few years especially due to the fact that a large portion of the banking population uses internet or electronic banking.We are going to address the most common types of how criminals access your account and money as well as ways to make sure this doesn't happen to you. Cloning works as follows- criminals swipe your card through a machine that replicates and stores all your credit card details which can then be placed onto a new blank card which becomes an exact replica of your card (including now having access to you credit limit). When making any purchase with your credit card, be sure to never let it out of your site. If you are swiping for a purchase and the employee says they need to fetch a new machine or the machine is out of paper, DO NOT let them walk away with your card, insist on your card back and when they return you can hand it over again to continue with the transaction while you watch this.Common place for these criminal activities is at the duty free section of airports as criminals know you are about to board an international flight and therefore your phone and internet access will be switched off on the plane so you won't have any indication these fraudulent transactions have taken place until you land. You thought having a debit card is safer because its got a pin, right? We recently discovered a rather disturbing new form of card fraud taking place in SA. If you like so many others are under the impression that using your debit card to swipe for purchases is much safer than using a credit card because your debit card requires a pin, think again. Just like on a credit card, a debit card contains the card number, expiration date and ccv number (the 3 digit number on the back). Using the example above when paying for purchases and the employee happens to walk away with your card, all they need to do is quickly take a photo or write down those 3 sets of details and the following is now possible... Certain websites in SA that allow online purchases for good and services let you do so by entering your debit card information and as long as there are funds available (including your overdraft facility) and wait for it... You don't need to enter your pin number for these transactions!! This terrible (and scary) fact, unfortunately makes debit cards now as valnerable as credit card when it comes to the information displayed on your card. A solution to curb this is to write down your ccv number and keep it safe somewhere and then simply blank it out on the card using a permanent marker or equivalent (this won't damage the card at all but will give you piece of mind). Banks have gone to extremes to ensure all their internet banking facilities are completely secure and hack proof but unfortunately no matter how safe their internet banking facilities are, the one thing they have no control over is how well you look after your own log in details.. Due to the fact that to login and transact requires numerous security checks such as passwords, your card details and one time pins getting sent to your cellphone there are still people that are causing their own security to be breached. Here we explore the most common ways fraudsters access your internet banking. Their favorite is to send you an email saying that you need to follow the link and urgently change your password. A few notes on that, firstly your bank would NEVER ask you to do that and if there was a security issue with your account they will call you and ask you to login through their website. 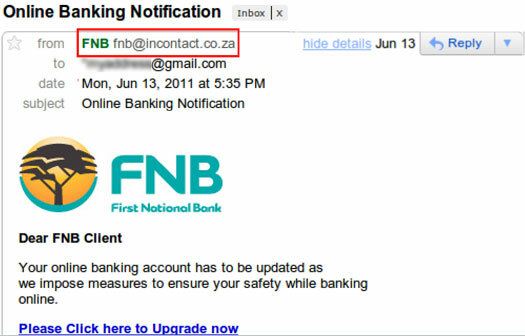 Secondly, should you receive one of these emails, look at the address it was sent from, if it was FNB for example the address would have to end in @fnb.co.za which you will notice is clearly not the case. An example of this is shown below.. When accessing your internet banking, type in the full website address in the browser eg) www.fnb.co.za. If you need to get a sim swap for your cellphone, be sure to change all your passwords on your internet before you do this as you will be unable to see if your account is being accessed or alternatively speak to your bank about alerting you on an alternative number while your sim swap is in progress. We hope these general tips help you avoid becoming a victim of banking fraud. Above all though, just remain vigilant at all time with regards to your card details and how you access your internet banking.